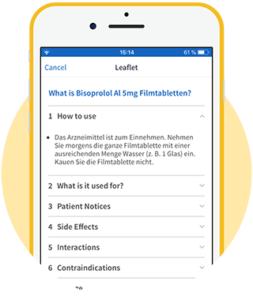 Follow your personal therapy plan easily anytime and anywhere - with our free medication reminder app mediteo. Three easy steps to take your medication safely. Tap on the ‘+’ symbol in the upper right-hand corner of the medication page and enter the name of the medication in the search field. Then all you need to do is to select your medication from our comprehensive database! Our integrated barcode scanner makes adding medication to the app even easier. Just scan either the PZN code on your medication’s packaging or the QR code of your ‘federal medication plan’ (Bundesmedikationsplan). Your medication will be automatically added to mediteo. 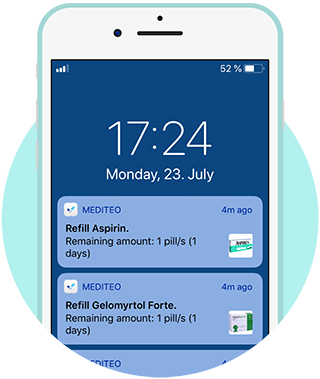 mediteo offers personalised medication schedules which can be tailored to your needs. Our snooze feature means you can postpone your reminder for the occasions when you can’t take your medication on time. mediteo creates an intuitive to-do list for you based on the medication you need to take. You can assign icons to different drugs, and when you tick off a dose, you’re rewarded with a smiley and the dose turns green in the calendar view. Red dots in the calendar help keep track of missed or unconfirmed doses so you can keep on top of things. mediteo gives you access to information about your medication every time you take it. This may contains information about side-effects and general symptoms. It means you can check important information quickly and easily in the app whenever you need it. If you add two drugs that contain the same active ingredient, mediteo alerts you about a possible double dose and recommends that you get in touch with your doctor or pharmacist to clarify if that’s a potential risk. mediteo also reminds you to restock your medication if you’re running low. Just enter how many pills you still have left and how far in advance you want to be reminded to restock your prescription. You can check how pills you have left whenever you want, so you’ll never forget to restock in time. Stay on top of your symptoms, moods and measurements with a digital diary. mediteo lets you record your weight, blood pressure, pulse, temperature, and blood glucose level daily. You can also use it to monitor pain or mood swings, as well as oxygen saturation and peak flow. Never lose control again! No registration is necessary for the use of mediteo. Your data remains on your device and is backed up to the latest encryption standards so that no third-party apps can access that data. All data will only be transmitted in encrypted and anonymous form. Neither we nor our partners have access to your personal data and we can therefore assure you that your data will not be passed on to third parties. If you have any further questions on the subject of data protection, you can always contact us: support@mediteo.com .